May 6th, 2017 marked the most awaited event for Marvelites and comic book fans alike. The day when they actually got free copies of comic books from Filbars, Comic Odyssey, DK Collectibles, Critical Hit: Comics and Games just to name some. Not to mention cool posters if you're one of them early birds! Meanwhile for Marvel Future Fight players, nothing can be more satisfying than getting free in-game stuff. 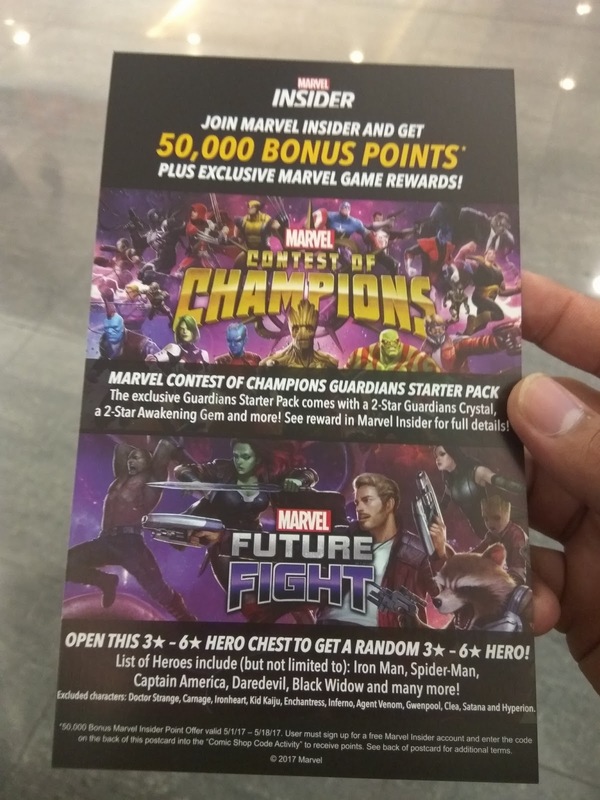 As relayed by some of the well known gamers from the biggest Marvel Future Fight Facebook Group, Free Comic Book Day organizers were giving away some nice looking cards like the one below. Photo courtesy of John Kenneth Velonta. The code mentioned in this article MUST be redeemed between May 1st, 2017 and May 16th, 2017. Rewards will be awarded in game by June 1st, 2017. This card from the event actually had some sort of promo code that we can use to get a free 3* - 6* character. The good thing is even if we're unable to get the physical card where the promo code is written, we still have a way to get our hands on these random 3* - 6* freebies since the promo code may be the same for everyone according to peeps who were able to attend the event. The said promo code is GOTG2BKHSKJZ. Check on the steps below for the prerequisites and whatnot. You MUST have a Marvel Future Fight account. You MUST have a GMail attached to your Marvel Future Fight account. Go to http://marvel.com/insider and login using your account if you already have one. Otherwise you need to create an account. Don't mind the "OPEN TO U.S. RESIDENTS ONLY." notice - you should be able to create one. Once done go to https://marvel.com/insider/home which should take you to FEATURED ACTIVITIES. You should see the Comic Store Code Redeem option right away. Click on it. A popup box like the one below should appear. If no popup box appears, you might want to check on your ishtyuufeed popup blocker. Type the GOTG2BKHSKJZ on the popup box and click on the SUBMIT button. 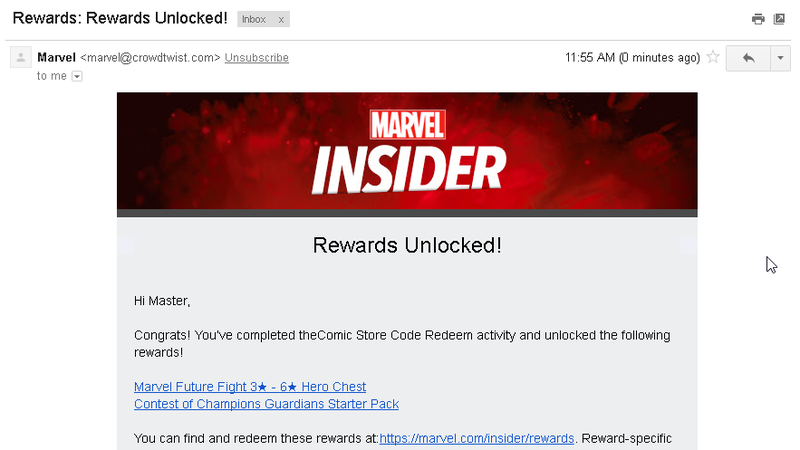 The code should give you 50000 Marvel Insider points. Plus the promise to get the reward some time in June. Marvel Insider will send you an email. Check your GMail spam folder or your forwarding rules in case you don't see one. The email should look like the one below. Colleagues at Marvel Future Fight Philippines. Special thanks to John Kenneth Velonta.